Well, all that’s done now. Rehearsals, photos, concerts for ballet and concerts for preschool – you name it, we were doing it! All that is over now and I feel a little more at peace. Now I can finally concentrate on Christmas and what we’ll be doing on the big day. It looks like we’ll be going to nana’s house, where we will have lunch and open presents. I have offered to bring chocolate peppermint cupcakes with red and white swirl frosting and crushed candy cane sprinkles (I will post photos!). These past busy weeks have meant that I haven’t had a lot of time to stand around and bake, unfortunately. In turn, I feel like I have neglected The Sweetest Kitchen! I still don’t have anything new to post here today, but I do have a handful of recipes that I have photos of and have never posted. 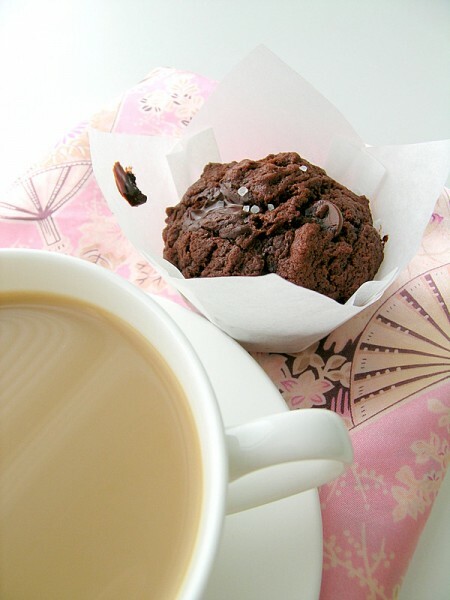 Today I’ll share one of these – double chocolate chunk muffins. I have posted a recipe here before for double chocolate chip muffins, but wasn’t thoroughly satisfied with them. These particular muffins are very muffiny and chocolatey and go well with a cup of coffee! I added both chocolate chips and chocolate chunks to these muffins, and tossed a teeny bit of sea salt on top as well. 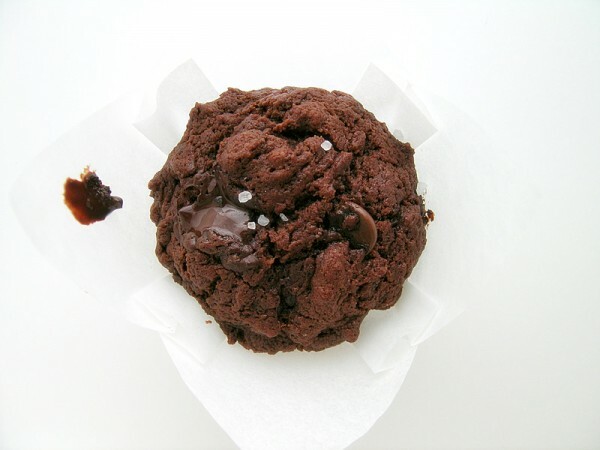 An easy recipe for double chocolate chunk muffins. Preheat oven to 180C. Line a muffin tray with paper liners. Mix all dry ingredients together and make a well in the center. Mix all wet ingredients together and pour into the well. Add chocolate chunks and mix until just combined. Do not overmix as this can result in tough muffins. Spoon batter into liners and bake 15-20 minutes. I love the addition of sea salt. Glad to hear things have calmed down for you a little. Gosh this time of year is so crazy. This reminds me that I’ve been trying to work on a healthier chocolate muffin recipe, so far not so good. Two tries under my belt and still not satisfied with the results, maybe I should just call it a day and make these instead. They look oh so tempting. Why do muffins seem not so unhealthy as cupcakes? These look amazing! My kids would go crazy over these! They are the most delicious chocolate muffins I think I’ve ever seen. I’m definitely making these very, very soon.